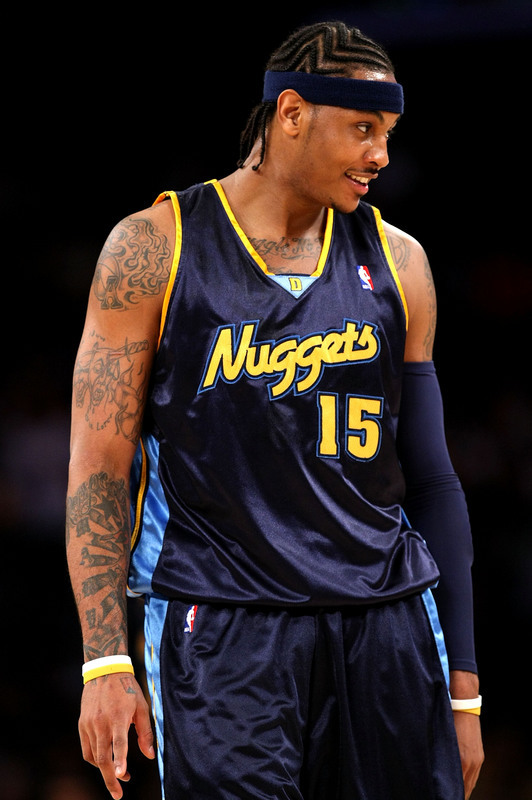 It is almost a foregone conclusion that Carmelo Anthony (pictured above) will not be wearing a Nugget's jersey at this time next year. Could he be wearing a Laker's jersey? Here are some of the major headlines today. This year's Heisman Trophy Winner, Cam Newton (pictured above) has had a monster season both on and off the field. Expect him to make a final statement in willing his team to a victory over Oregon tomorrow night. Tomorrow is finally the night of the big game. It has taken a full 4+ months to get to this point, but the time has come. 34 Bowl Games down (after tonight’s Kraft Fight Hunger Bowl), 1 monumental one to go. It is the matchup that everyone has wanted since mid way through the season. It is the matchup that not only the entire College Football Fan base has wanted for a while now, but it is exactly what the BCS wanted. Two teams that were not ranked in the preseason AP top 10 go head to head (this has never happened in the BCS era). The BCS dodged some major bullets this year with how things worked out. Auburn could have easily taken an L in the Iron Bowl this year, when Alabama had them on the ropes. What if Michigan State did not blunder at Iowa this year, or Ohio State at Wisconsin? What if Boise State’s Kyle Brotzman does not have the worst game of his life versus Nevada? There are a lot of “what ifs,” but there are only two teams left standing. The two very best in College Football. Grab your popcorn, because there are about to be some fireworks. Now I am not going to ram the stats down your throats. You have been forced to listen to the minutia and buildup to this game for well over a month now. The fact of the matter regarding this National Title Game is simple. The teams pitted really like to light up the scoreboard. They both rank in the top 4 in the land for points scored a game. The Ducks have been held under 35 points once the entire season and Auburn has scored over 50 on 6 different occasions. The intriguing thing for both of these squads is that neither is pass happy. Though football at nearly all levels has become a pass first game, both of these squads accomplish most of their damage via their rushing attacks (they can throw the ball with authority too) Granted they both have two very mobile quarterbacks that can make plays with both their arm and their feet. I do not see this game being as high scoring as all analysts are predicting. Many are calling for this one to have more points than the legendary National Title Game of 2006, when Vince Young propelled Texas over USC 41 to 38. Generally the first quarter of National Title games feature offensive blunders, while each team shakes off major nerves. Now I do think each team will put up points, but I do not see both teams scoring 40 plus. 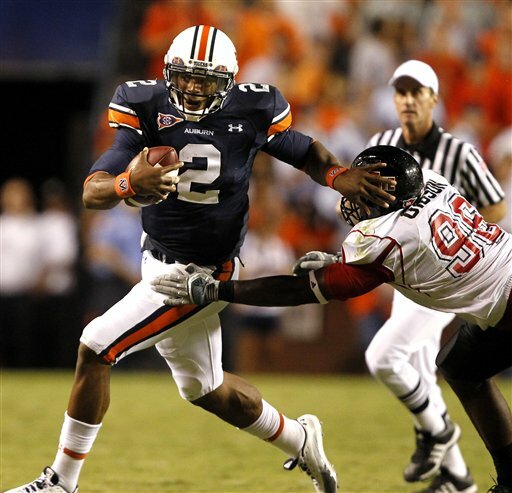 The X Factor in this game will be Cam Newton and Auburn’s overall team speed. Now I realize that Oregon has some players that have what I like to call the “burners.” But they have not faced a team with the speed that Auburn features across their entire roster. Many have been saying that the fact Oregon has a stronger defensive unit will be the differentiating factor that gives the Ducks the advantage. Lets be real though. The PAC 10 is a very good conference. But it is nowhere near the caliber of the SEC. Auburn’s defense played phenomenal competition all year and still held its own enough to give their offense a chance to win every game. Look for a Vince Young like performance out of Cam Newton. Just hopefully he does not pan out like Young in the NFL. I got Auburn winning a very exciting game 34 to 31. I will admit that I said in my College Football Preview that this would be the year the SEC’s reign of National Championships ended. I had no idea that Auburn and Cam Newton would come along back in September. Cam Newton and the Tiger’s overall team speed will give the SEC its 5th straight National Championship. The Heat have now won 12 games in a row. The "Main Event" this week involves a matchup between the Heat and the Lakers on Christmas Day. It is the start to another stellar week in the wide world of sports. Lets take a look at the pulse of the action. 5. Come Thursday, there should be a heavy focus on the NHL. It should be no surprise to you why people should tune in to NHL Hockey. Sure two of the top teams in the NHL are going head to head. But it is the Kobe/Lebron matchup of the NHL. Sid “the Kid” Crosby leads his Penguins to the nation’s capital to take on Alex Ovechkin. Who you got? Crosby or Ovechkin? 4. College Football Bowl Madness continues. 3 of 35 are complete. Lets keep them coming. Beef “O” Brady’s Bowl: Southern Miss vs Louisville-America will get to see 1st year Louisville coach, Charlie Strong, lead his team into their first bowl game in 4 years. Contrasting styles should make for a fun one in St. Petersburg. Louisville has lived on its defense all year while Southern Miss has lived on its O.
MAACO Bowl: Utah vs Boise State-This is hands down the best game of the week. Two teams that were both ranked in the top 5 at different points during the course of this season. Plus, this could be the last time we get to see Kellen Moore suit up in the Bronco Blue. If you get to watch one College Football Game this week, watch this one. You will not want to miss Titus Young and Austin Pettis play in their last game. Outside of a kicking breakdown, Boise has played a near perfect season. San Diego County Credit Union Poinsettia Bowl: Navy at San Diego State-Navy can straight pound the rock. Not the most appealing game to watch. But if you want to see some old school, smash mouth football, Navy is the team to watch. San Diego State will provide some pass heavy offense, led by their QB, Ryan Lindley. Sheraton Hawaii Bowl: Hawaii vs Tulsa-Tulsa is one of the luckier teams in the country. They first of all got to defeat Notre Dame in South Bend. Now they get to head to Hawaii for a bowl game? Not to shabby. Both of these teams can really score. Expect both offensive units to put up 35 plus in this one. Hawaii has the most lethal passing attack in the country for a change and Tulsa is right up there as well. The difference is that Tulsa can run the ball effectively too. Take note of this fact when picking a winner for this one. 3. Not the greatest week for College Hoops. Christmas always is a time to spotlight the NBA. But, there are some good matchups, especially on Wednesday. Here is a look at the two marquee games on Wednesday. Missouri vs Illinois: One of the top dogs in the Big 12 takes on one of the better teams in the Big Ten. Missouri plays basketball at a gut wrenching pace for all 40 minutes. Welcome to the fastest 40 minutes in basketball. Outside of Washington, not many teams play at this pace for the duration of games anymore. Outside of a heartbreaking OT loss to Georgetown, a game they should have won, this team has looked pretty strong. They will score points, averaging just under 86 a game. Illinois on the other hand fell to the only other Big 12 foe they played this year (Texas), and are coming off of a shocking loss to Illinois-Chicago. This team though also has beaten some very tough teams this season such as UNC and Gonzaga. You will not want to miss this one. Texas at Michigan State: I applaud both of these squads for playing brutal non conference schedules. They are already preparing their teams for March. So what if they each have suffered multiple losses. You cannot undervalue big game experience in November and December. Please note though that all 3 of the Spartan’s losses are against current top 10 teams. Texas did suffer a loss to an unranked foe in USC, but they have beaten some top-notch opponents such as Illinois and UNC. This should just be a great all around game. I will be very interested to see how Cory Joseph, the Longhorn’s freshman phenom, matches up with experienced Spartan guards such as Kalin Lucas, Durrell Summers, and Korie Lucious. Should be a fun one to watch. 2. I had to give Geno and his ladies some love. Sure I realize that most are not as in to Women’s College Basketball as Men’s. But this is history folks. The great John Wooden’s record could fall. Tomorrow (Tuesday) evening, Auriemma looks to make history. The Lady Huskies go for their 89th consecutive win! Yes I said 89th. Can you imagine winning 89 straight games? Can the Seminoles somehow stop this train? Do not count on it. 1. This week’s NBA slate will not disappoint. Every night features a big time matchup. Tonight, there are two great games. The Magic bring their new look squad to the ATL to take on the always dangerous Hawks. And the Mavs head to Miami to take on the red-hot Miami Heat. Can the Mavericks cool off the South Beach All Stars? On Tuesday, the Mavericks have to recover in a hurry as they head over to take on the new look Magic. Come Wednesday, the Garden will get a taste of Kevin Durant. Can he put on a big time performance against the overachieving Knicks? Then Thursday, as Orlando continues on with their “hell week,” the Spurs come to town. Christmas is always an awesome day in the NBA though. Boy did the League outdo themselves with the slate of games that they put together. Chicago at New York: Derrick Rose and the “Noahless” first place Bulls head to the Garden. Big time players always put together memorable performances at MSG. Plus it is Christmas. Expect Derrick Rose to put up a triple double as he wows the New York crowd. Now I will state, up until the 2nd half of the game vs the Heat on Friday, the Knicks had thoroughly impressed me. They have played way above their talent level. Amare looks like an MVP. Gallineri is playing like an All Star and really has developed an all around offensive repertoire. And Felton has rejuvenated his career. So what if the New York guys are not quite at that Miami or Boston level. They are good enough to make the playoffs this year. Plus they have caught the attention of Melo. You add Carmelo to this team, they are a contender in the East. You add CP3, the Knicks are a title contender again. Boy would that be fun. Boston at Orlando: The two teams that have owned the Eastern Conference the past 3 years link up in Disney World. This is the final game of the Magic’s “Hell Week.” Will Orlando have anything left in the tank for this one? They will have already played the Hawks, the Mavericks, and the Spurs already before they even get to step on the floor with the C’s. Boston is playing outstanding basketball. Though they are missing Rondo, do not expect a huge drop off. I am curious to see how the new look Magic match up with the Mean Green Fighting Machine. Heat at Lakers: Kobe, Lebron, Wade, Gasol, and Bosh on the same floor? No this is not the All Star Game. This is the primetime game of the day though. And boy is it one that every basketball fan in the country has been waiting for. 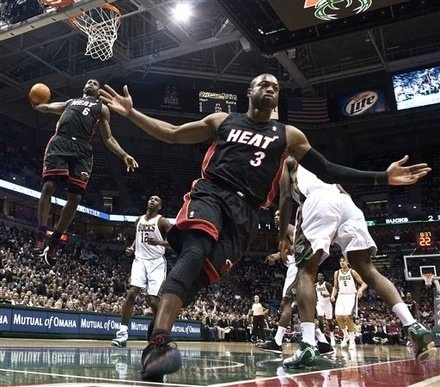 The Heat have gelled, winning 12 straight games. There could not be better timing for this game. All of the stars will be out (not just those on the floor). Do not take away too much from this matchup though. There is still a lot of basketball to be played. But outside of Lebron’s return to Cleveland, this is the year’s most anticipated game up to this point. Also, there are two other games on Christmas. It will be a Merry Basketball Day. So there you have a look at this week’s main events. And I did not even touch on the NFL’s Week 16. You better believe that there is a ton going on. Let me hear your thoughts. How will the arrival of Anquan Boldin in Baltimore and another number 81 in Cincinnati affect the AFC North this year? Welcome to perhaps the most brutal conference in the NFL. Or at least the most physical. These teams are generally tough both on and off the field. Most off-seasons, you hear a lot of press about what these players are doing with their spare time and normally it is not good news. You ever hear the saying, “No news is good news?” Well the AFC North does not believe in that saying. This is a division with great rivalries, great players, and great fans. Many say Pittsburgh, or “Shitsburgh” as many Cincinnatians like to say, possesses the best fan base in American sports. All I have to say is, there is no love lost in the rivalries of this very unpredictable and talented division. Cleveland Browns (4th place): It seems like the Browns have been inhabiting the cellar for some time now. In actuality, they have resided in this position every year but 2 since the year 2002. So there is quite a familiarity with always looking up at their rivals in the standings. And this year will be no different for a town where things continue to get worse. The Indians have been god awful the past few years. Their “King” and savior Lebron James, just jumped ship and added insult to the wounds by having a 1 hour special to make the “Decision,” and the Browns continue to struggle. Also lets not forget that winters in Cleveland are awful. But this team truly does not have much to bring to the table. They had the worst offense in the League last year for a reason. They had a passing attack that reminded me of watching a high school team (averaging 129 yards per game). This year they will have a new QB in Jake Delhomme, who can hopefully rekindle the fire a little bit. Also their rushing attack will rely squarely on the shoulders of Jerome Harrison and the rookie out of Tennessee, Montario Hardesty. Now Harrison is not terrible, nor was Cleveland’s rushing attack last year. But this was partly because they ran the ball so much. Also on the offensive side of the ball, much will be expected of Mohamed Massaquoi and Joshua Cribbs. Massaquoi had a few big games last year, and has the talent to be a big play receiver. But does this really sound like an offense that will be able to score against the likes of the Ravens, Bengals, or Steelers? On the defensive side of the ball, the Browns are nearly just a bad. This unit will depend heavily on a hopefully healthy Shaun Rogers, a hopefully healthy D’Qwell Jackson, and the always fun to watch Eric Wright in the secondary. With the arrival of TO in Cincy and Boldin in Baltimore, Wright along with his buddies in the Cleveland secondary may actually need some Pepto Bismal. Lastly, realize the best play the Browns have is on their special teams. No team in the League possesses a threat like Joshua Cribbs in the return game. This may be the Brown’s only hope to steal some games in the brutal AFC North. As many in Cincinnati say, “If it is Brown flush it down.” Well the Browns sadly are going to be down, and are in for another long season. Pittsburgh Steelers (3rd place): Yes, the Pittsburgh Steelers, one of the best run franchises in professional sports will go a second consecutive year without tasting the postseason. It is not that the Steelers are even so bad, it’s that the Bengals and Ravens will be very tough this year. When talking about Steeler football, defense always comes to mind right away. And this team does have a rough a tough defensive unit. They are one of the top run stopping teams in the League, but do struggle with defending against the aerial attack at times. James Farrior and James Harrison continue to get better with age it seems like. Troy Polamalu, when healthy is one of the League’s best. And Ryan Clark is becoming more and more well-known around the League for his bone shattering hits. But the flash of the secondary cannot hide its inability at times to defend against the pass. Big hits only can get you so far in this League. Guys like Ike Taylor, Ryan Clark, Troy Polamalu, and all the recently drafted rookies in the secondary could make or break this team down the stretch. Can Pittsburgh prevent the big play? Offensively this team has a major issue before the season even starts. Big Ben Roethlisberger, their quarterback and leader, will miss at least the first 4 games, and possibly more. This will hurt. It would not have been as big of a blow in the past, since the Steelers were always a smash mouth running team. But they have turned into a pass first offense along with most of the NFL. Can Dennis Dixon make sure the Steelers do not dig themselves another early season whole this year? Because believe me, the Ravens and Bengals will be too tough to allow Pittsburgh to dig out of a massive early year deficit. Is Rashard Mendenhall ready to carry the load as the featured back? How many more solid years does Hines Ward have left? The loss of their top receiver Santonio Holmes hurts, and it will be interesting to see if young guns Mike Wallace and Limas Sweed are ready to step up. Pittsburgh will be a good team this year and win probably 6 to 8 games, but they will not be good enough to make the playoffs. There are just too many question marks on both sides of the ball. Baltimore Ravens (2nd place): The bad boys out of Baltimore will make the playoffs for a 3rd consecutive year. And though they would prefer to win the division, they will still be a tough out as a Wild Card. This team has had a fantastic off-season and finally look to have the tools of a top-notch offensive squad. So the Ravens will finally have a very tough offense to compliment their always tough defense. Defensively, it is the same story it has been for the better part of a decade. They stop the run better than anybody, rarely ever giving up 100 rushing yards in a game. Ray Lewis, the future Hall of Famer, and possibly the best linebacker of all time continues to perform even at the ripe age of 35. They also feature a very strong safety tandem in Dawan Landry and Ed Reed. Plus Terrell Suggs, along with Ray Lewis may be the best linebacking duo in the League (even though Ray is 35). But the corners have been a question the past couple of years, and may be the only minor flaw on this otherwise awesome team. Can Domonique Foxworth, Fabian Washington, and David Carr defend the likes of the Bengal’s outstanding trio of big play receivers? These matchups will probably determine who wins the AFC North. So strap in for some excitement there. There is also the Ravens now revamped offensive side of the ball. Joe Flacco, looks to be a quarterback that will continue to win in this League for some time. And now he has some great weapons to throw to in Anquan Boldin, Derrick Mason, and Donte Stallworth. He also still has the former ASU standout, Todd Heap to throw too. Also the Ravens possess one of the best rushing attacks in the entire League. Between the up and coming Ray Rice, Willis McGahee, and big boy Le’ron McClain, defenses beware. These guys are no fun to deal with. And with the look of a team that should really be able to throw the ball downfield, teams will not simply be able to just key on the vaunted Raven’s rushing attack. Look out for the Ravens in 2010, as they look to go deep into the playoffs. Cincinnati Bengals (1st place): Who Dey Nation has been celebrating for the past couple of days. The TO Show has arrived in Cincinnati to add to an already solid receiving corps. This team, which was one of the League’s best in running the ball last year should now be able to throw deep with authority. They have 3 big play receivers in Owens, Ochocinco, and Bryant. Not to mention the surehanded Andre Caldwell to act as a possession guy, and Jermaine Gresham at tight end. Also they have one of the League’s best running backs in Cedric Benson. Carson Palmer has a heck of a team to work with offensively. Be ready to witness the Carson Palmer of 2005 all over again. Redemption will be so sweet for the former USC standout. The Bengals on the defensive side of the ball last year, behind the tutelage of Mike Zimmer, became one of the League’s elite. Do not expect that to change this season as guys continue to get healthy. The Bengals were extremely efficient at stopping both the run and the pass. The cornerback tandem of Leon Hall and Johnathan Joseph is now known around the football stratosphere as one of the League’s elite. Really for the Bengals, there are two question marks. First of all is Carson ready to start playing like an elite quarterback again(which I think he is)? And secondly, can the Bengals get healthy at safety and defend against a team like the Ravens, who have so many weapons? With the Bengals, as with any team around the League, the big challenge is to stay healthy. But this is by far the deepest and most talented team Marvin Lewis has ever had in Cincinnati. Look for this team to have a big time year and play deep into the postseason. So there you have. The AFC North will be brutal as usual and will be represented in the playoffs by both the Bengals and Ravens like last year. The only real question in this division is can the opposing secondaries handle the deep threats of the Bengals and Ravens? We will begin to find out come September. See any resemblance to Joe Montana or Steve Young? 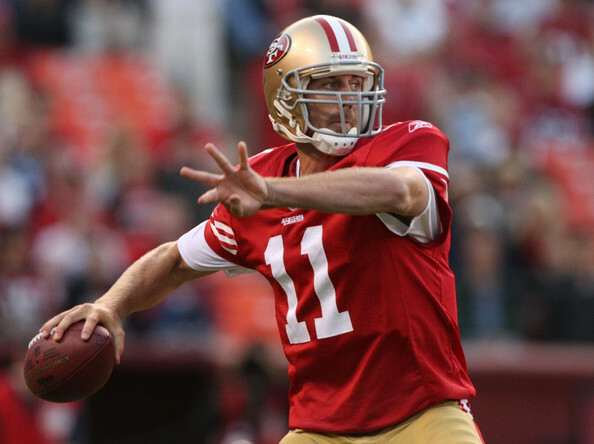 Well Alex Smith is ready to lead the 49ers back to the playoffs for the first time since 2002. The NFC’s version of the Wild Wild West has not been the most glamorous conference in recent memory. In fact, they have not sent 2 teams to the playoffs since 2003. They also have not had more than one team with an above 500 record since 2003. So generally, you have one team do solid, another team do around 500, and the other 2 just finish absolutely abysmal. This year appeared like it could be different. It appeared that there could possibly be 2 teams with a fighting chance to make their way into the playoffs. That was until Arizona lost their quarterback to retirement and one of the best receivers to the Ravens (Kurt Warner and Anquan Boldin). St. Louis Rams (4th place): The Rams had a nightmarish season last year. And though I think they will do better than one win this season, I do not see them finding themselves out of the division cellar just yet. Sure they drafted a very talented quarterback in Sam Bradford. And sure they have an outstanding running back in Stephen Jackson. But really what else is there? I mean Albert Pujols cannot suit up for this squad. This squad featured one of the worst passing games I have ever seen in recent memory. And to think, we are only 10 years removed from the “Greatest Show on Turf.” Guys like Donnie Avery and Laurent Robinson must step up and provide the rookie Bradford with some targets. Sure Stephen Jackson is a great guy to have for rookie Sam Bradford to hand the ball off too. But the NFL has become a pass first League. You cannot win without some sort of passing attack. The Rams, unfortunately, are going to struggle in this department all year. The Rams defense is not to amazing either. In fact, it looks to be on its way to a horrific year. I guess a team that goes 1 and 15 generally is not too strong in many areas. James Laurinaitis will have a ton of weight put on his shoulder to anchor the defense. He is no longer a rookie and will be expected to be the engine that makes the defense go. But other than that, there is not a whole lot of promising prospects on this defense. I do think they will finish better than 1 and 15, but not much. Seattle Seahawks (3rd place): Rainy Seattle will once again fail to make the playoffs for the first time since 2007. This team features both a sub par offense and defense. Matt Hasselbeck is a very savvy veteran that really just does not have much to work with. 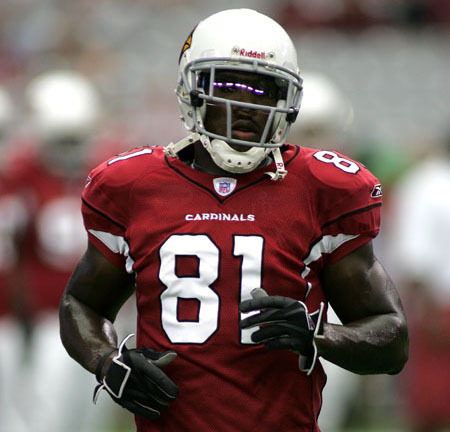 Sure TJ Houshmandzadeh is a great possession receiver, but the loss of Nate Burleson hurts. Golden Tate, the outstanding receiver out of Notre Dame will be expected to produce from Day 1. He will be expected to be a big play guy similar to a Steve Smith type of mold (lots of pressure on the little guy). This team cannot survive simply with Houshmandzadeh. I mean this team does not have much of a rushing attack. Justin Forsett and Leon Washington are not necessarily gamebreakers. Maybe Washington will surprise some people and start to really produce, but I wouldn’t count on it. Then you look at the Seahawks on the other side of the ball. And there really isn’t a whole lot of star power to look at. Who will step up? Nobody really knows. The main thing Seattle has going for them is the arrival of former USC Head Coach, Pete Carroll. Now normally coaches do not do so hot going back and forth between the League and College in any sport. But this guy has been running a professional program for years now. Plus he had 15 years of “official” professional coaching experience before he arrived in Trojanville. Just ask USC what they think about it. Maybe he could get this team to come somewhere near 8 and 8? I would say it is highly doubtful they win 8 games, but who knows, it could happen. Arizona Cardinals (2nd place): This is a team that probably lost the most of any team in this division. They lost a big time number 2 receiver in Anquan Boldin. They lost a big time quarterback in Kurt Warner. And with Kurt and Anquan, goes a major part of the high-flying attack that has carried the Cardinals for the past couple of years. This is a team that has lived and died on the pass reminiscent of the way many college teams play today. They had a rushing attack that did not even average 100 yards a game. Yet they advanced to the playoffs? Go figure. Times have really changed. Offenses have slowly but surely turned into pass first teams all around the League. I mean the Cardinals do have 2 decent running backs in the massive Chris “Beanie Wells and Tim Hightower. But neither of these guys get many opportunities in this pass happy Cardinal’s offensive scheme. If Steve Breaston does not emerge as a big time number 2, Arizona’s offense could collapse in that teams will double on Fitzgerald and the passing attack will die. And this does not even get me started on Matt Leinart. The man came into the League with so much upside but has vastly underachieved. This year will be his chance. There is also a defensive side of the ball. And the Cardinals are not too good at defending. They like to play shootout style games where they score a ton of points, and give up lots of points. A way that you can tell this team has struggled defensively is players like Adrian Wilson and Antrel Rolle are 2 of the top 4 tacklers on the team. These guys both play in the secondary. So I feel like this team will probably win 6 to 8 games. But there have been too many losses on the offensive side of the ball for them to outscore all of their opponents and their defense does not appear too promising on paper. San Francisco 49ers (1st place): Yes, this is the year we have all been waiting for. The 49ers long awaited return to the playoffs. There were the Joe Montana days. Then the Steve Young days. Now there are the..Alex Smith days? You better believe it. This team has not gone over .500 since 2002. Well that all changes this year. There will be a changing of the guard, or at least a retro look in the West. With the 49ers back on top. This team has been knocking on the door for a few years now and is ready to come inside. The 49ers have a solid defense that is led by in my eyes the best linebacker in the game, Patrick Willis. You should have heard of this guy already, but if you have not, he is here to stay. They also have the veteran leadership of a linebacker that has been around the block in Takeo Spikes. This team boasts arguably the best linebacking core in the League. They also have a solid secondary led by former Pro Bowler Nate Clements, and the veteran Mark Roman. So expect this team to be ranked among the League’s elite on the defensive side of the ball. And on offense, this team looks to improve from a dismal showing last year. They will be led by a young group in Alex Smith, Frank Gore, Vernon Davis, Michael Crabtree, and Josh Morgan. These guys are all young, but ready to show that they are entering the primes of their careers. Also do not forget about the always dangerous Ted Ginn Jr. This team will not be one of the League’s elite offensively, but you better believe that they will put on a much better performance than last year as they begin to gel and enter the primes of their careers. Hopefully the 49ers can keep this core group on the offensive side of the ball together for years to come. San Francisco will return to the playoffs for the first time in 8 years. So there you have it, a changing of the guard in the NFC West. A return to the old. The 49ers are back and look poised to be solid for the next few years with a relatively young group.